Located in the Center of Vinh City, opposite to Ho Chi Minh Square, Central Park and Intimex Supermarket, Phuong Dong hotel is 5 km, 16 km and 15 km far away from Vinh Airport, Cua Lo Beach and Kim Lien Vestige area respectively. 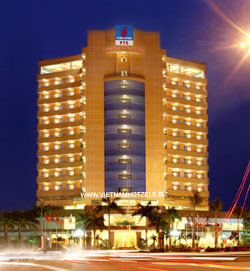 Phuong Dong is the unique 4 star hotel in Vinh City with 176 luxurious rooms. There is system of restaurant, meeting room, swimming pool, tennis ground and services of entertainment, health care, SPA. International Travel Center specialize in organizing foreign and domestic tours which are attractive and original. Employee staff is professional, experienced and rich in hospitality. Phuong Dong Hotel is an ideal choice of honored guests when you are arrive to Nghe An - homeland of Uncle Ho Chi Minh. Sao Mai Restaurant with capacity of 250 persons are decorated modernly and romantically, major in serving European food with attractive and various menu processed by top experts and served by team of professional employees that satisfy you. Thien Thai Restaurant is located in the 15th floor with capacity of over 150 persons, major in serving Asian food, specialties of Vietnamese food are processed by fomous cook with a lot of experiences. Just here, you not only enjoy special dishes but also contemplate dreamlike beauty of Vinh city.